Use the form below to inquire about Heritage Villa At Naggar Road . Use the form below to reserve for Heritage Villa At Naggar Road . The serenity of the Himalayas will surpass your idea of a luxury holiday at the Heritage Villa at Naggar Road. The Himalayas need no introduction. And what more can you ask for when you have these magical mountains in the backdrop of your home away from home, the Heritage Villa at Naggar Road. Located in Kullu, one of the most popular hill stations in India, the resort has a never-ending supply of crisp mountain air. There is tranquility all around, with lush gardens and fruit orchards dotting the landscape around the resort. If you try to listen, you might also hear the sound of the Beas River meandering gracefully in the Kullu Valley. The enchanting beauty of nature together with the comforts of the resort will make your holiday a truly memorable one. The Heritage Villa at Naggar Road is a luxury resort in the lap of nature, away from the hustle and bustle of the city. It features traditional Himachali architecture that is a combination of stone façade and wooden roofs and railings. The estate on which the villa is built has a variety of fruit orchards, including apples, kiwi, walnuts, pears, and pomegranate. Although the cool climate of the region makes the resort a great place for a summer getaway, you can also make it your winter abode while experiencing Kullu’s snowy winters. Also, the resort is a favorite among the who’s who of Bollywood. You never know which personality you might end up meeting during your holiday! There are four types of suites at the Heritage Villa at Naggar Road that make accommodation at the resort a thing of luxury. The Royal Suite, the Family Suite, the Garden Suite, and the Orchard Suite are the four accommodation categories available at the resort. All these suites have spacious, well-furnished, and well-equipped rooms. You’ll find all the modern luxuries and essential amenities you need in any of these room categories. Nothing can be more refreshing than spending your much-awaited holidays in the middle of the mighty Himalayas. So, come and prepare yourself to be pampered. 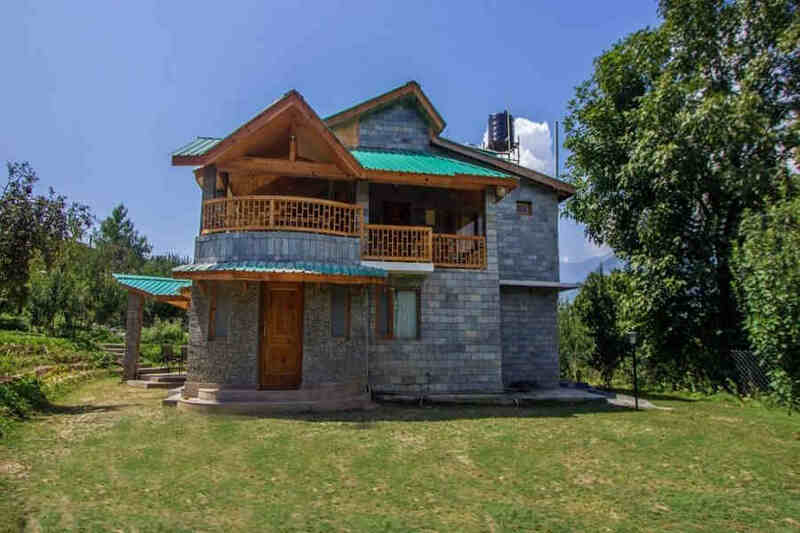 The resort’s strategic location makes it a great place to explore the best of what the Kullu Valley and the neighboring town, Manali, has to offer. You can start by visiting the Kullu town and its markets. Located only 3.7 km away from the resort is the resort is the Roerich Gallery that features numerous works of art. A little further, 20 km to be precise, is the popular Raghunath Temple. You can also take a half-day trip to visit the popular hot springs of Manikaran, located approximately 59 km away from the Heritage Villa at Naggar Road. If you want to indulge in activities such as hiking or walking to experience nature at it finest in the region, the resort can make the necessary arrangements. You can also go for a village picnic to see what traditional Himachali villages are like, visit a monastery, go on a fruit picking trip, get a massage, or indulge in a private campfire dinner too. If you’d rather stay at the resort and not venture out, the resort also has a host of indoor and outdoor games for both children and adults. Adventure junkies shouldn’t miss a chance to experience some of the adrenaline-pumping activities that are popular in the region, including river rafting, paragliding, skiing, hot-air ballooning, helicopter rides, and more. Trout fishing in river Beas and trekking are some of the other activities to keep you busy during your holiday. At 30 km, Bhunter Airport is the closest airport from the property. Airports at Chandigarh (297 km) and New Delhi (540 km) are the other options to consider. The resort is easily accessible by road from cities such as Shimla (227 km), Chandigarh (289 km), and Delhi (522 km). Some of the nearby attractions include Manali (22 km) and Leh Ladakh (23 km). Chandigarh Railway Station (295 km) is the most convenient station to travel to and from Kullu from other parts of the country. Joginder Nagar (150 km) and Delhi (527 km) are other popular choices of travelers.